Thought this rumour was worth posting. A couple of the ideas sound cool such as the treeman/ hag combo but I am a bit disappointed the eternal guard may be dropped. 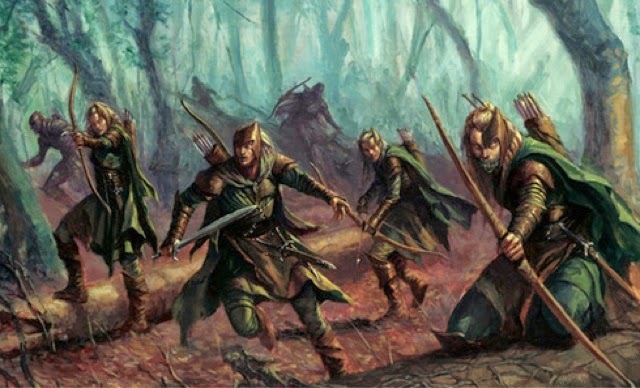 Although the army has and should always keep the guerrilla feel about it, I always thought there should be at least one ranked up unit to represent the wood elf lord's personal guard. I plan on posting pictures of my autumn themed wood elf shortly including my large unit of eternal guard soon to be war dancers apparently. Wood Elves are coming in May, and we have some details to the extent of the release, and hints on how a 9th edition will work with skirmishers. There are three new plastic kits, an armybook, and magic cards coming. It looks like a good release for Wood Elves. Wood Elves have always held my attention, and its been a while since we have seen any real attention given to them. The three kits sound good, and the detail that Fantasy kits get often feels extremely well done. I look forward to seeing more rumors regarding Wood Elves. Please remember that these are rumors, but are from a good source. As with all rumors a little salt is always required. Wood Elves are out in May. They get only a two week release - armybook, magic cards and three plastic kits. It is not a total overhaul and their finecast kits - even the cavalry plastic-finecast-kits - stay valid. The only exception is the eternal guard. They are dropped completely. The models can be used as war dancers. One of the new kits is special because it can be used for several different units. You can build either three hawk riders, which are one hawk and two surfers now, or three giant owl-like monsters called stonefeathers and six waywatchers. On top of that you can build a hero on hawk or on foot. The second kit is a war dancer combokit. The second unit wears varying animal masks and shields made of pelt on wooden frames. They have animal claws as weapons. The last kit is tree ancient and meadow hag. The former is a giant-sized tree man with a huge beard made of bark. The latter has a crown of leaves and she has a skirt of roots instead of legs. Her hands grow into a web of thorns. The rest of the range stays as it is, the finecast kits probably mail order only.